Henry Louis Gates Jr. argues that Africa's historical "achievements have been obscured, first of all, because of slavery... And then after 1884 was the conference in Berlin, when European powers sat down, looked at an empty map of Africa, and basically carved it up like you carve up a pizza pie... they had to create a fiction of Africa as an empty place or a static place full of primitive people ... We were robbed of a history because Europeans wanted to justify an economic order which depended upon our ancestors’ exploitation.... "
The robbery, such as it was, may have been facilitated by two other factors. Sub-Saharan African kingdoms lacked written records, and while some had robust oral traditions, of the sort familiar to pre-literate European societies, such oral histories seemed rather less substantial than the abundant written literature of Greece or Rome. And with a few exceptions, sub-Saharan kingdoms built cities of earth and wood, constructions which did not leave impressive monuments such as those of civilizations that built temples and palaces of stone [the nomination of the Wall/Moat of Benin as a UNESCO World Heritage Site foundered on the inability of proponents to provide a site map]. But careful Europeans who came into contact with sub-Saharan Africa were very much aware of the intricate history of the numerous pre-colonial polities. And if the histories of these proto-states were neglected in the early 20th Century, they had nontheless been recorded with some fidelity in the 19th Century. It may be flattering for the Western mind to think that Africans were in a primitive state of barbaric anarchy when Europeans arrived on their continent to settle, trade and "civilize". However, this notion is not supported by the evidence presently available. 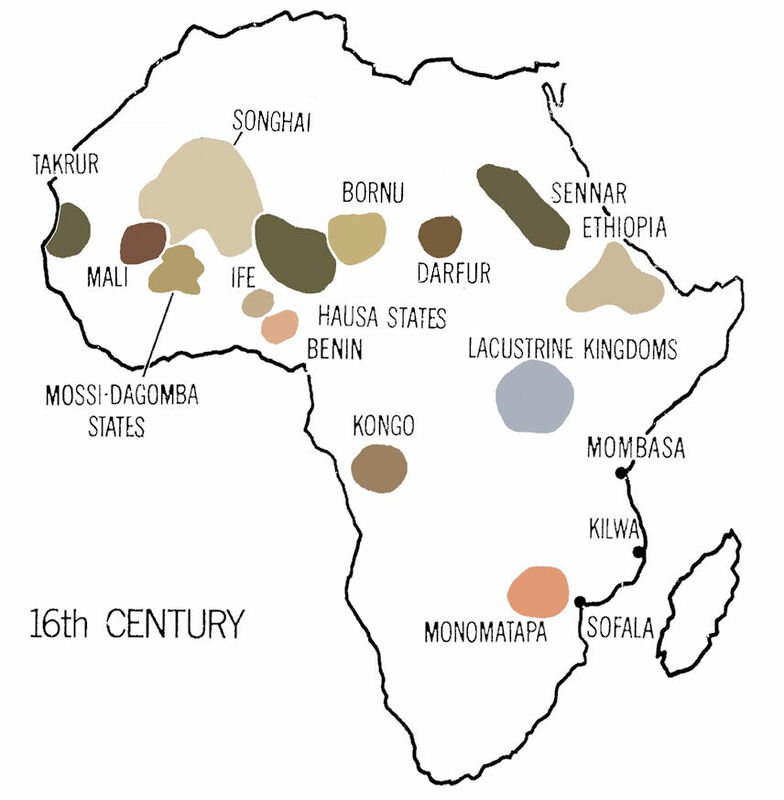 The lush African continent was home to many ancient cultural groups, speaking thousands of different languages, long before the transatlantic slave trade developed in the Americas. 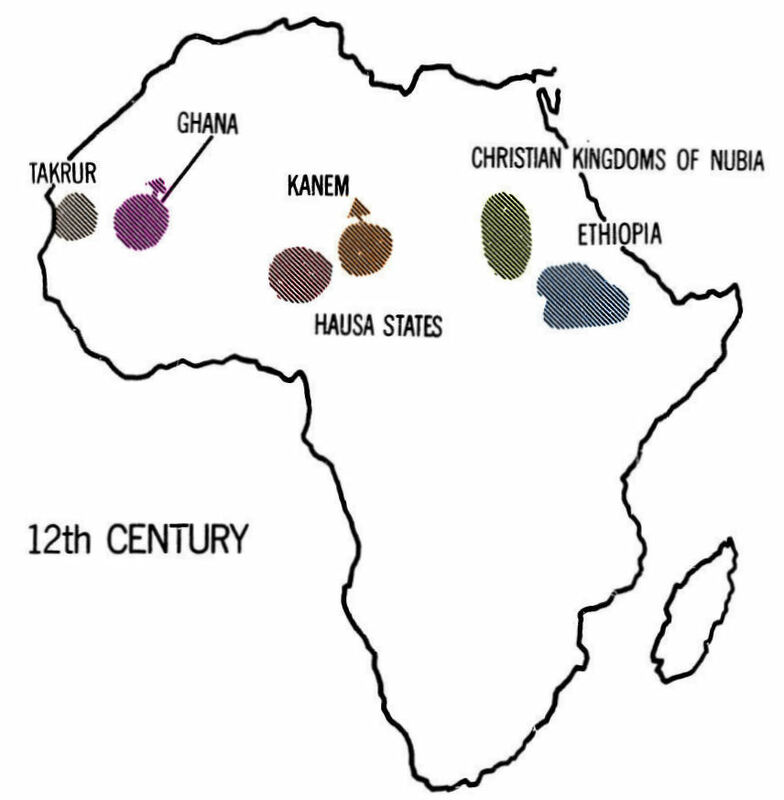 Among the ancient kingdoms of Africa were Kush, Ghana, Egypt, Ethiopia, Mali, Zulu, and Ashanti. History lists kings and queens of Africa who reigned over these powerful kingdoms earlier than 3000 BC. The lands south of the Sahara had seen the rise and fall of scores of small city states, good-sized kingdoms and giant empires before any European so much as set foot on the shores of tropical Africa. And indigenous states and empires continued to evolve and reach maturity in the ensuing 300 years. Some of these - Ghana, Mali, Songhai - may be now be somewhat familiar to many; others such as Zimbabwe, Axum, Kush, Kanem-Burnu, Kongo and Benin, may not. Yet all were once major political states and dominated large numbers of people living in Africa south of the Sahara. There cannot be a definitive list of pre-colonial sub-Saharan states. There are roughly four dozen that consistently gain attention, but as for the rest, the situation would be familiar to students of the Holy Roman Empire, which included a few kingdoms that persisted for centuries and made history. It also consisted of hundreds of minute polities that largely lack histories independent of the biographies of their rulers. The succeeding German Confederation counted fifty-odd component entities, the least of which [by the standing of their ruler] being a Landgraviate and a Seignory. So it is with Africa. There is no natural limit to how small a polity might be, and over the centuries there were surely hundreds, now largely forgotten, that were little more than a single chief of unusual vigor. Much of sub-Saharan Africa was not organized in states, much less in large empires on the order of Mali. West Africa had many regions of “stateless society,” where kinship patterns formed the basis for settling disputes and where no one individual was permanently in charge; no individual, or any small group, held or claimed a monopoly over the right to use force. In the past, some historians thought that these stateless societies were “primitive” or “less developed” forms of government that would naturally give way to the state forms as soon as people found out about state styles of government. A powerful state is not necessarily an advantage for those who live under its control. Stateless societies have therefore persisted alongside states for centuries, apparently by choice. Many of these stateless peoples, for that matter, have had more advanced agricultural techniques than those who lived in states. Historians now believe that statelessness was often preferred, but that states were sometimes essential to meet the threat of foreign military power. States were also useful though not essential, for the protection of long-distance trade. Until the 1350s two-thirds of the world’s supply of gold came from sub-Saharan Africa. People would either mine for gold or sift for gold in streams. Gold wasn’t as valuable to sub-Saharans as it was to other peoples. Gold went north and salt and other goods from the Mediterranean went south through the trans-Saharan trade. Gold was brought to the east coast for the Indian Ocean trade network. The gold-salt system remained the same in sub-Saharan Africa except for the time period between the fall of the Ghana Empire and the rise of the Mali Empire. The Akan people live in the coastal savannah and forest zones of southern Ghana. The Akan were living in well-defined states by the early sixteenth century at the latest. By the end of that century, the states of Mamprusi, Dagomba, and Gonja had come into being among the Mole-Dagbane peoples of northern Ghana. These peoples and states were significantly influenced by Mande-speaking peoples from the north and the northeast. In the extreme north of present-day Ghana are a number of peoples who did not form states in pre-colonial times. These peoples, such as the Sisala, Kasena, and Talensi, are organized into clans and look to the heads of their clans for leadership. Like the Mole Dagbane, they were heavily influenced by Islam, introduced into the region centuries ago by trans-Saharan traders or by migrants from the north. 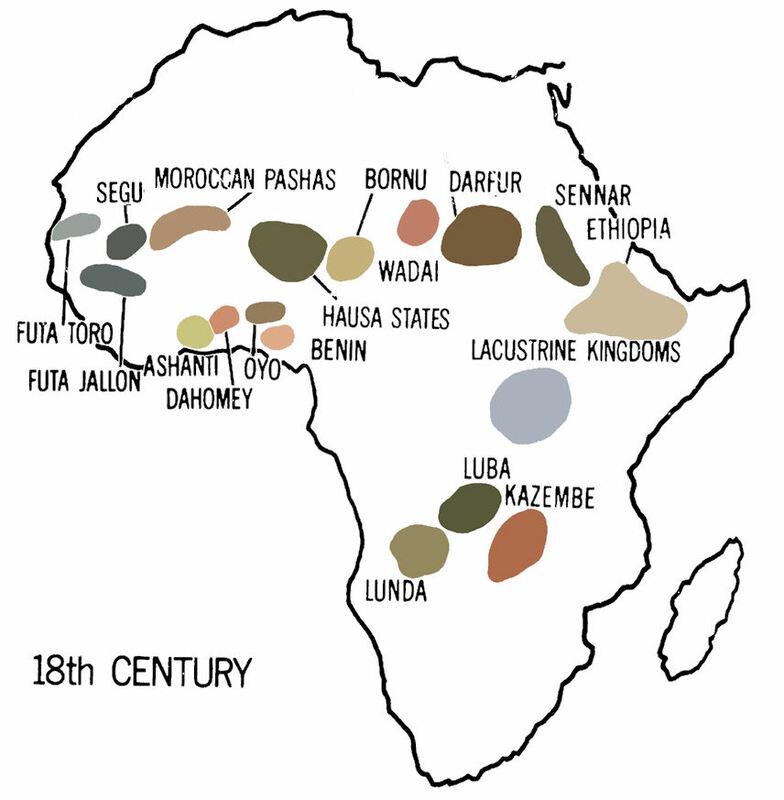 The sixteenth century marked a high point in the political history of northern Nigeria. 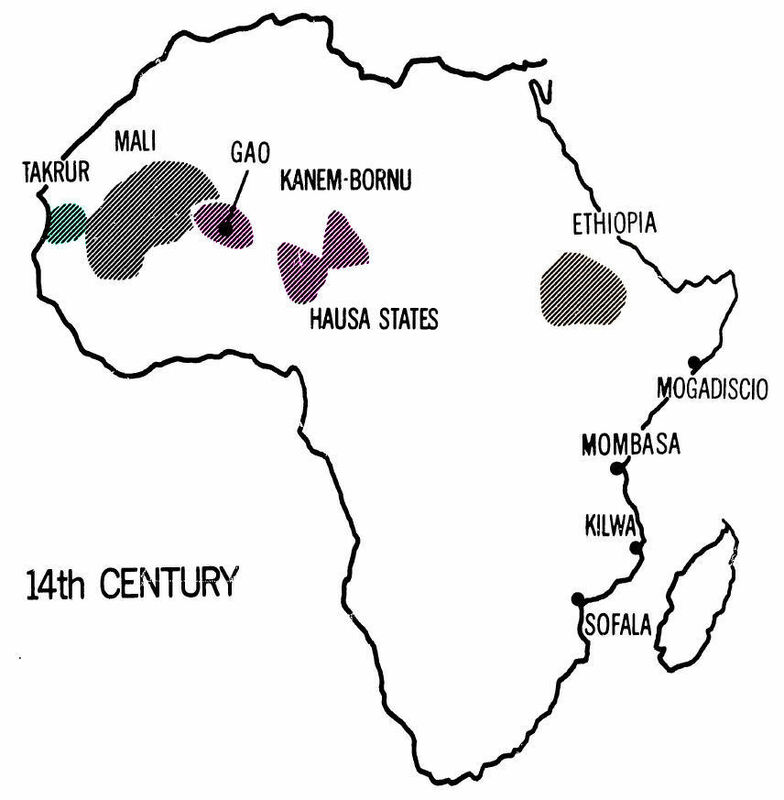 During this period, the Songhai Empire reached its greatest limits, stretching from the Senegal and Gambia rivers in the far west and incorporating part of Hausaland in the east. At the same time, the Sayfawa Dynasty of Borno asserted itself, conquering Kanem and extending its control westward to Hausa cities that were not under Songhai imperial rule. For almost a century, much of northern Nigeria was part of one or the other of these empires, and after the 1590s Borno dominated the region for 200 years. The major cause of Borno's decline was a severe drought and famine that struck the whole Sahel and savanna from Senegal to Ethiopia in the middle of the eighteenth century. There had been periodic droughts before; two serious droughts, one of seven years' duration, hit Borno in the seventeenth century. But the great drought of the 1740s and 1750s probably caused the most severe famine that the Sahel has known over the past several hundred years, including that of the 1970s. As a consequence of the mid-eighteenth century drought, Borno lost control of much of its northern territories to the Tuareg, whose mobility allowed them the flexibility to deal with famine conditions through war and plunder. Borno regained some of its former might in the succeeding decades, but another drought occurred in the 1790s, again weakening the state. The ecological and political instability of the eighteenth century provided the background for the momentous events of the nineteenth century.